Virat Kohli and Anushka Sharma got married yesterday, far far away from the public eye and for some reason this makes me very happy. Honestly, I'm not a huge fan of either of them but I do respect Virat for the amazing sportsman that he is. I truly believe that he will create magic in the world of cricket. Together, he and Anushka make a wonderful and a powerful couple. He is a thorough gentleman and has stood up for her ladylove time and again and she has continued to support him silently. As a couple living in the time of social media, they were not too in your face with their PDA or just their love in general. 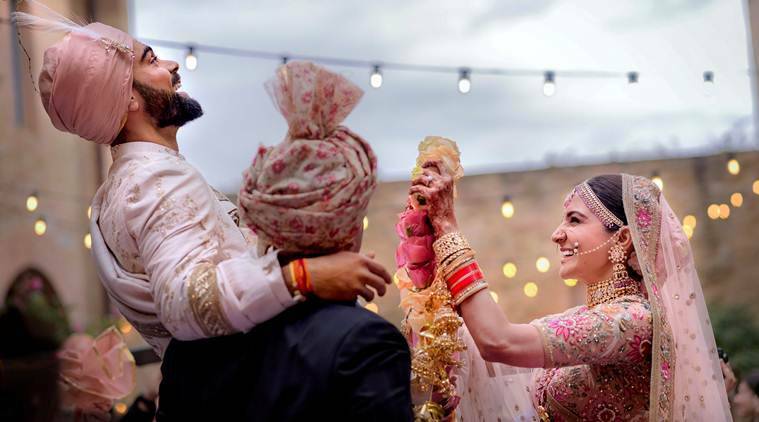 Virat did give us peeks of their love story on special days like Valentine's and Women's day, but apart from that they were in a world of their own. I have never said this about any celebrity couple till date, but they do give love a whole new meaning and make us believe in the concept of togetherness once again. I know most of you are bored by now, but I am still not tired of seeing their pictures all over social media. They look so damn happy and that makes me really happy. Their marriage was a private affair with just 44 guests and this is how perfect weddings are supposed to be. Their marriage was a union of two people in love and that is what a wedding is supposed to be. A celebration of the two people involved. Just that and nothing else. Together, they looked so happy and the hug they shared after their engagement ceremony brought tears to my eye. It was a victory of love all the way. Both of them are relatively young and so successful in their own fields that somehow together they seem perfect. While they sure will host larger than life receptions, keeping their wedding a secret from the media and away from the public eye was the best thing that they could have ever done. Big weddings are a waste of time, money and emotions. It hardly is a celebration and the love between the couple that should have been the focus of the celebration is lost in the charade of the showoff of pomp and glory. I had an unnecessarily big wedding, the debt for which I'm paying till date. Today, as I look back I realize what a waste that was. Yes, I was marrying the man I love, but honestly that was the only good thing about the wedding. While I did enjoy the rituals, after a point of time it became tedious and strenuous. We had so many guests that by the end of the day we were exhausted standing up on the stage. So many people came to the wedding and I didn't even know half of them. The other half, well, I did not want them there. Only a handful of our genuine friends were there with us to celebrate our love and our union, while the rest were there to check how much was being spent on the wedding. Oh yes, and to complain about the food! A happy union for us was a field for querulous grumbling among our relatives which in a strange jobless manner continues till date. If my husband and I could have had it our way back then, we would have had a simple registered marriage and then held a small party for our friends and a handful of people who matter to us. Preferably at a pub or at home. A marriage for us means the celebration of love and commitment and that is all that we wanted. But it turned out to be a chaotic, expensive affair. We could have finished the whole wedding in 10% of the budget and saved everyone involved from going bankrupt. But since our parents fell into the "log kya kahenge" trap, here we are paying off our loans as we wipe our brows with tissues that have complaints from people regarding a few things from the wedding. So my friends, if you are looking to get married some time soon or some time later, please do it like Viruskha and go simple. I know they got married in one of the most expensive holiday destinations of the world, but they did it with minimal people and just promised to love each other forever. That is how a wedding should be. It should be more about the love and commitment, that's what you call a marriage. Everything else is a farce. Instead of going in for a big fat wedding with a thousand guests who are more likely there only for the food which they will complain about later, you can do the following with the money instead. Spend the least amount of money on the wedding and go for a long honeymoon instead. Go to an exotic location or take a trip around the world with the one you love. Believe me, you'll make better memories this way. Invest in your dream car with your love. This way, it will come of use too. Buy a house together and do it up your way. This can be your first project after the wedding. Together. Buy all the books that you have wanted to and read! Because, books! Keep the money in a deposit and reap benefits out of it. This way you can retire early and spend more time together. Take the first step towards entrepreneurship for added security and a sense of having something of your own. Instead of feeding heartless souls, donate the money to charity to feed people who cannot afford it. Don't donate for religious causes though, that's another sham. Always remember this, while a wedding is between two families, a marriage is only between two people. If you can make the wedding only about the two people getting married, that's the best gift you can give them. Indian weddings are a serious waste of money. Private ceremonies are the way forward. You have said it so apt. I believe now it is upto our generation how we will carry out when the time will come to get our children married. We will have to make the change and I am up for it. Oh yes! I will be up for it too. Many parents need to get it as well. I did not have a elaborate wedding. VT and I kept the gathering small and most of our guests still talk about how they felt good about the ceremonies and closeness. We even stayed in the same hotel on different floors to separate out the bride and the groom side. So, I agree that no point wasting money when you can put it to better use. Btw - They look adorable in the pictures. So happy and in love. That's so nice. I wish I had got married that way too. They do, right? I smile every time I look at those pictures. totally agree with this post... the 'log kya kahoge' trap makes many a family suffer... instead any of these options would be a worthy investment instead! You could easily buy a car with all the money spent for,well... the public! Oh yes! Families need to see the hole they are burning in their bank accounts for just one ceremony. A public bus sure sounds like a good investment too. There is such a fairytale like quality to Virat and Anushka's wedding. They've managed to strike the perfect balance between too much PDA and too much mystery. They have been so very level headed on social media. The entire country is in love with both of them. I loved your suggestions on what one can do with the money one saves from an elaborate wedding. 'Get a library' sounds sooo good. I cannot agree more. I love seeing their pictures, and the unadulterated joy on their faces - that's what a true union should be about. Oh yes! It makes me believe in love again. What are divyakshi menus, BTW? What a gorgeous couple they make. You can't help but like them. And who can blame them for doing it away from India. It is a terrible media circus here which would have swallowed all their ceremonies. Of course, they had the money to make it happen. Imagine getting married with 50 guests, most of your family and friends would not talk to you, ever. That is the mentality which people have when it comes to weddings. I wish we all could have smaller ceremonies. Mine was despite many coming for reception, the wedding itself was a cozy affair with a few close family members. It is so much nicer that way. My elder son already says that (if) he gets married, he is not doing any nonsense of wasting money. I say Amen to that! They do look gorgeous, don't they! Together they make such a powerful couple! Your son is growing up to be a wise boy. Elaborate weddings are such a sham. I was just talking about this with a friend yesterday, how they were so smooth with this wedding, and have been so all along. No mushy posts, just simple love for each other. Love the idea of a registered marriage with a party later on for only those peeps you actually want there with you on the D-day! Lovely post Soumya; wish more peeps think of doing it this way! !